What is a Burpee? This is a fun exercise that you can do just about anywhere that you have the space. You can make them your full workout or you can do a burpee in between your weight lifting, planks, other cardio, etc. It is important to learn the proper form and know your body's capabilities before even trying to do a burpee routine. Why do we burpee? The benefit of burpees is a full body workout that is both cardiovascular exercise and strength training. So, burpees burn a lot of calories in a short amount of time and burn the body fat, too. The Adapted / Modified Burpee videos below will show you how to do easier and / or less strenuous versions of them, or you can challenge yourself with the Sumo Burpee routine in the 2nd video (add a push up in between or do them super fast). If you are not flexible or out of shape, or you have had a mild to severe injury, you should ask your doctor before doing these and / or use your better judgement before jumping into a burpee workout routine. How To Do The Perfect Burpee - This guy does an awesome job of showing you how to do a regular burpee and burpees with push ups in between. Doesn't he make it look so easy? It might be for you; give it a try! 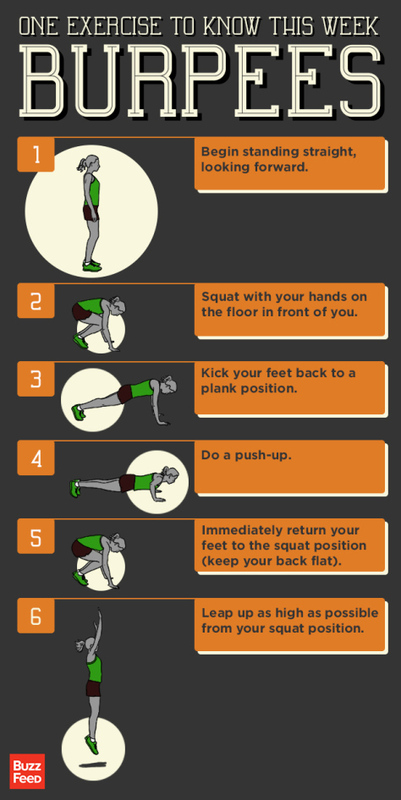 This is how to do the Sumo Burpee that we do sometimes in our Fitness Challenges. If you can't do a burpee, then replace with one of the modified burpee exercises below or do squats, plank or other helpful exercise. Check out these videos for burpee variations that are easier for beginners, out of shape or injury. Step Out Burpees are easier because you adapt the speed and jumping. It is good for people who need to start off a little more controlled because of flexibility or coordination issues, or have a mild injury. Slow this down how you need; just make sure the format is right to avoid any injury. Wall Burpees are an extremely low impact and easier way to do burpees if you cannot jump, get down on the ground or have injury. This could be good for seniors just getting back into a routine. Weight Loss, Fitness & Health are major subjects we discuss in our Facebook Group, so please make sure to join us if you are just getting started, need some support or motivation to weight management. We do squats, 10,000 steps, burpee and other exercise routines from the comfort of our homes, outside or at the gym if we choose. Perfect for daily exercise or to supplement your routine. CLICK HERE for the current fitness challenge posted on this blog. If there is not a current challenge listed, then please feel free to go back and do one of the previous challenges! HOW DID I DO WITH THIS BLOG POST?